The group show Eau de Cologne at Sprüth Magers in Los Angeles features work from the late-1970s to 2016 by Jenny Holzer, Barbara Kruger, Louise Lawler, Cindy Sherman and Rosemarie Trockel. The exhibition at Sprüth Magers’ recently-opened Los Angeles gallery is a follow-up to its predecessor in Berlin last year. It sheds light on key topics in these artists’ works, but also the specific history of the gallery and its connection to these important female figures of an art that subtly addresses women’s roles in very different ways. All five artists in the exhibition showed with Monika Sprüth during the earliest years in Cologne and have maintained close ties to the gallery since the early 1980s. Besides the exhibiting artists, the three issues of Eau de Cologne magazine that were published by Monika Sprüth between 1985 and 1989 featured portraits, interviews, conversations and essays with many other contemporary German and American women artists and figures associated with the art world at the time. The second issue of the magazine from 1987 has a work by Barbara Kruger on the cover and served as the basis for the current exhibition’s invitation poster design. 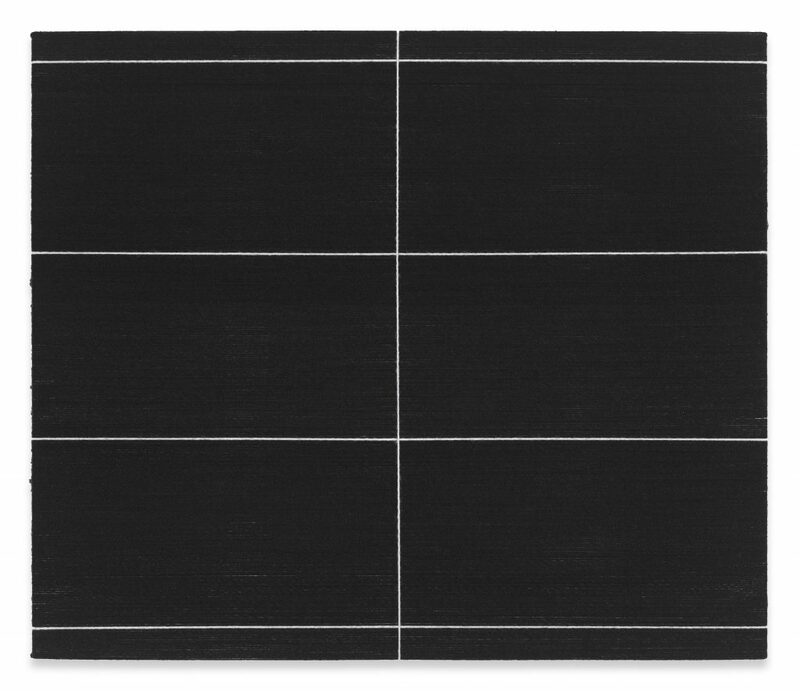 Both the magazine and the three exhibitions at Monika Sprüth Gallery in 1985, 1987 and 1993 served as reference points for this show. 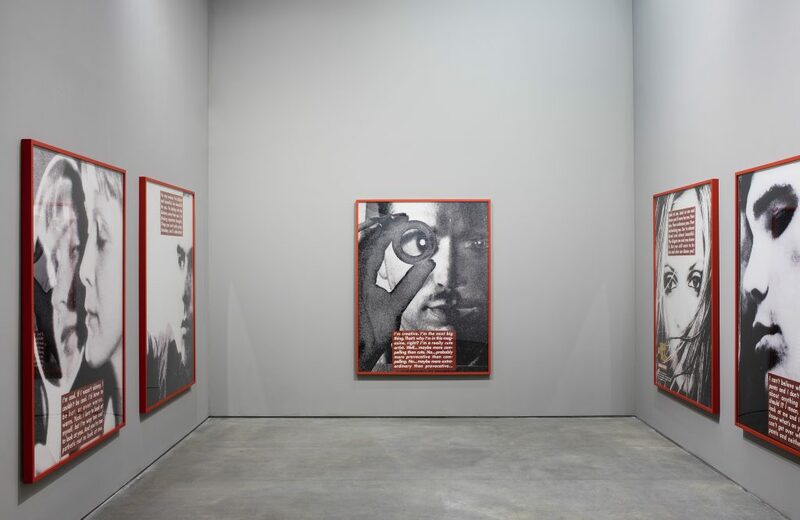 Barbara Kruger developed the photo series presented in this show in 1996 as a draft for her contribution to the British magazine Dazed & Confused. Her visual language draws from the world of graphic design and uses specific colors and text fragments familiar from advertising and everyday visual culture. For this exhibition, the page layout from the magazine was rearranged and recompiled, presenting it here as a new wall piece Untitled (Never Enough) (2016). Louise Lawler’s wallworks Andy in L.A. (adjusted to fit) (2004/2016) and (Bunny) Sculpture and Painting (adjusted to fit) (1999/2016) are part of a series of works in which she adapts earlier images and motifs to the architecture of the space available to present the work. 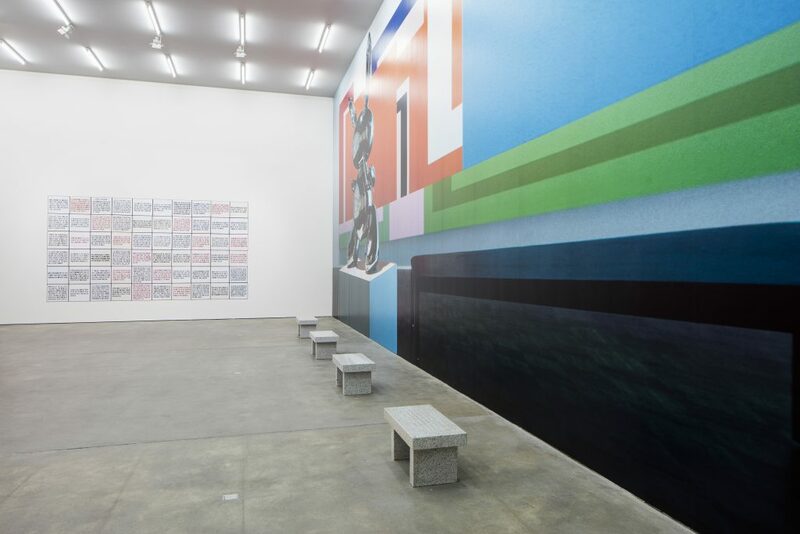 The installation view of a Whitney Museum exhibition showing Jeff Koons’ Rabbit (1986) and Peter Halley’s The Acid Test (1992) raises the issue of art’s reception through modes of viewing and the presentation methods used in private contexts, public museums and the market that determine the artwork itself. Rosemarie Trockel draws her formal vocabulary from materials commonly associated with female activity such as wool or ceramics. No longer knitted with machines or by hand, her recent ‘wool pictures’ are created by wrapping loose strands of yarn around the canvas in stripes, touching on the larger painting discourse. The wool works are complemented by sculptures that address the concept of the readymade and design, but also the clichéd ‘female’ environment from which she derives her approach: Device (2015) and Landscapian shroud of my mother (2008), two sofas made of ceramic and steel, are shown along with Chateau en espagne (2012 and 2015), two folding beds mounted to the wall. Cindy Sherman’s Murder Mystery (1976), a precursor to her film stills, is a series of black and white photographs presented in the exhibition that examines the archetypical roles ascribed to females in film. 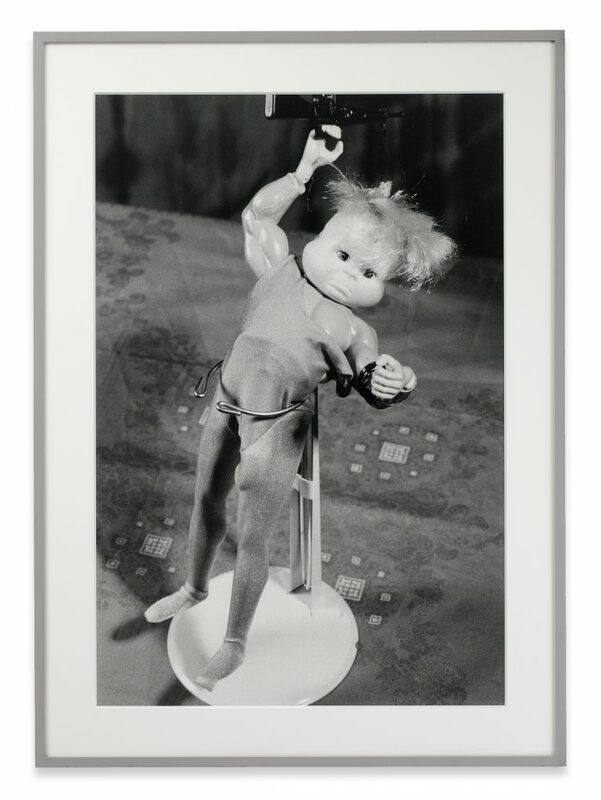 In her lesser-known series Broken Dolls, Sherman creates a self-portrait that can also be understood in terms of the same subject matter. In the new triptychs, Sherman cites her own work in the form of portraits with partly abstract, bizarre shots that highlight Sherman’s interest in the absurd, ugly and grotesque. Jenny Holzer works with materials drawn from ordinary, everyday contexts and the aesthetic of advertisements. Her visual vocabulary appears in the form of everyday ‘truisms’ and political texts like those seen on her 60 hand-painted enamel plaques (1980-82). 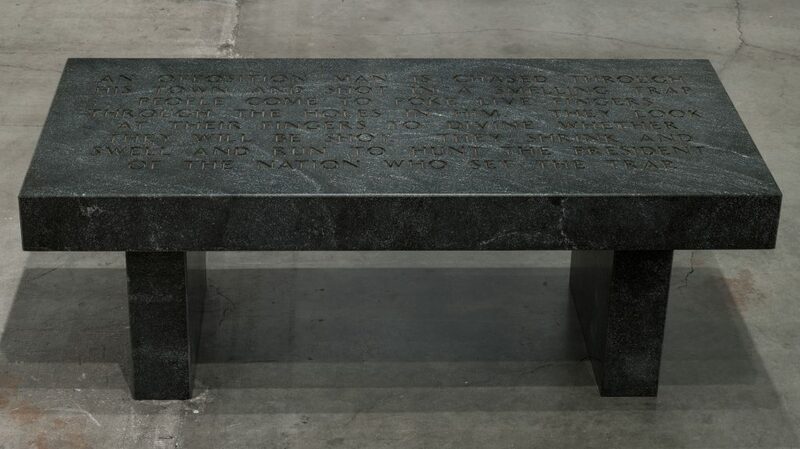 These texts also appear on LED signs and granite benches, where the specific use of language strikes a stark contrast with one of sculpture’s most traditional materials. Her canvas work Trust visions that don’t feature buckets of blood (1983-84), was created in collaboration with New York graffiti artist Lady Pink as graffiti art itself was just starting to emerge. 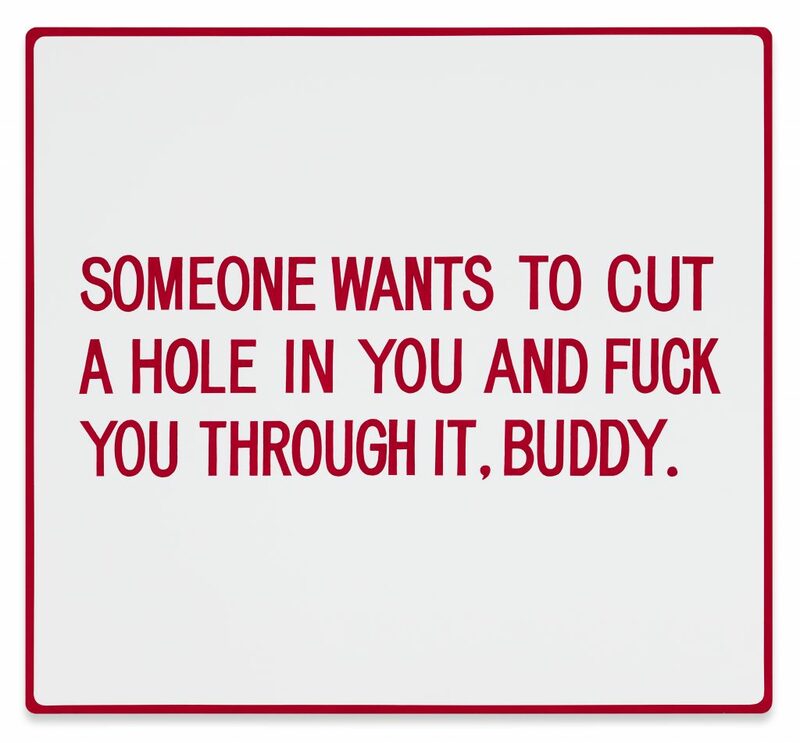 It also reveals ties to Holzer’s well-known political works. The key motifs and themes connecting these different positions are forms of political engagement, messages and questions that revolve around the individual in society from a female perspective. They reflect a discourse that has been ongoing in the history of the gallery from its beginnings in the 1980s to the present day. Installation view (Barbara Kruger), ‘Eau de Cologne’, Sprüth Magers, Berlin, September 17 – October 21, 2015 Photography: Timo Ohler. Courtesy the artist, Metro Pictures and Sprüth Magers. Photography: Timo Ohler, 2015. 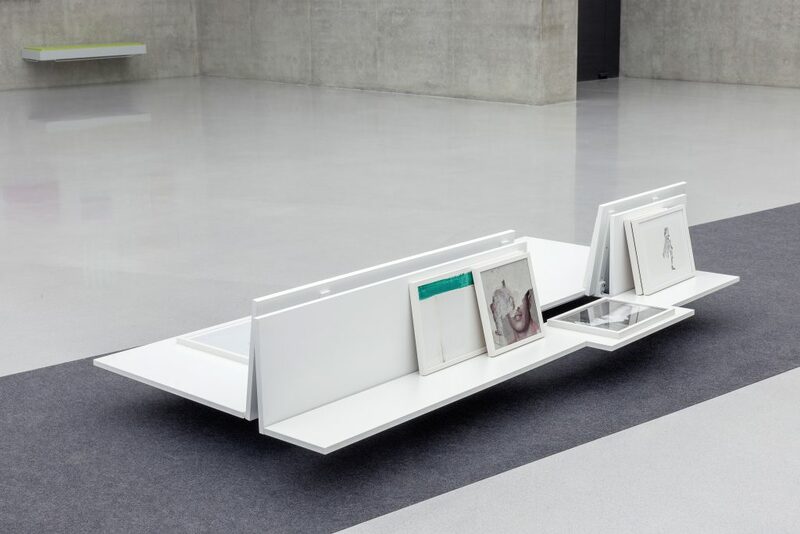 Sprüth Magers, Berlin, September 17 – October 21, 2015. Photography: Timo Ohler. Courtesy the artist, Metro Pictures and Sprüth Magers.